The story is basic but great, i love the pacing too. All of this happens so fast, just 12 episodes! but when you read the comments, all of them are like "i want s2" and you will be in the same boat as them when you`re done. But anyway, this is great, the anime is great, and now I´m to read the manga. Peace. And btw, the anime is chapter 1-13, so if you dont want to read what you just watched, then here you go! This is a great little add on to the Ao Haru show, it literally "wraps" the main story with episode 1 being a prequel of sorts and episode 2 being an add on after the occurrences in the main title. It definitely feels just like the parent show- simple and sweet. I recommend watching this after the main show, even though chronologically the first episode of the OVA comes first, because it messes up some of the foreshadowing and character exposition in the main show. Not too much to add in this section, feels just like the main show. I'd forgotten that Futaba's hair has so much volume! Expressions and emotions are great in this show overall, middle school Futaba's innocence is really well represented. Unlike a lot of run of the mill OVAs, this is not a filler between seasons; it actually adds substance to the show as a whole. 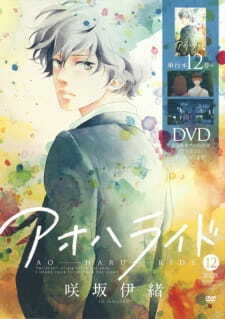 The first episode recounts how Futaba slowly and innocently falls in love with Kou. The second episode adds on to the ending of the parent show. Remember how Yuuri said she was going to get serious in the summer? Well, this episode takes place in summer. In addition, there are some really nice atmosphere scenes in this episode, some of which are ironically funny for the viewer. If you're looking for more of the pure, innocent hatsukoi story that is Ao Haru Ride, you've found it. We know a lot about our characters by this point, yet this still manages to add on quite a bit more. Even though I knew exactly what was coming in the first episode, the last scene with Futaba still caught me off guard, a brilliant way to round out the episode. The second episode was equally impressive as the dynamic character relations continue to evolve. Expect some rather bold advances and surprisingly a lot of screen time for Touma (the guy that Futaba "molested"). This is an absolute must watch for those who enjoyed the main show. It adds valuable content and further cements this show as one of the outstanding examples in the genre. Ao Haru Ride: Unwritten is more or less the scenes of Futaba and Tanaka in their middle school years from the TV series. More or less being, they're all included here but put together with new scenes added to the mix more so, instead of single fragments every now and then like the TV series. Let alone, it was really great. I personally loved the middle school scenes from Ao Haru Ride so this was really good for me, a whole episode about them in their middle school years. Although they don't introduce any new elements, possibilities or anything else the single fragments didn't introduce in the TV series, the touching story and great characters is what you'll be watching this for. As a "episode 0", there, of course, weren't any characters that were introduced after Futaba and Tanaka in the TV series, like I said they didn't add anything new the single fragments from the TV series didn't add, haha. Same thing as the TV series, the story here was incredibly touching. Nothing felt wrong in any aspect. A stunning ability the story of Ao Haru Ride has, is how they can turn a simple love story plot that may be overused, into something so fresh and wonderful. You feel like you've been there, but Ao Haru Ride makes you know that it's not the same. This is something I admired Ao Haru Ride for, such a simple story yet it makes you feel so connected to the show because of the way they make things look and explain things. This is most likely why I gave the story a 8 regardless of it being the same as explained in the TV series, it's a really touching story that bloomed in a great way thanks to its creators. Like I said, nothing changed here that you haven't seen from the TV series. It's pretty much reused since the whole point of this was to have an episode with all the fragments, so they didn't feel loose. This said, the art of course, is as beautiful as it ever was anywhere else. Always so living and beautiful, you know it makes you feel like you should be watching this. More copy and paste here, but what can do you do? As it was, the sound was incredibly fitting and was a little tear-jerker. The piano the show uses for it soundtracks leaves such an excellent taste in your ears. It would've been a 10/10 if I haven't already seen it since these are mainly scenes already seen in the anime. Seeing a whole episode dedicated to these scenes from the show really made my day, Ao Haru Ride was one of my top 5 most hyped for Summer season and it's still in my top 5, I'm glad along with the adaptation, we got this. The middle school scenes from the TV series were amazing and way too touching, so experiencing this once again was way too great. A touching, well developed story was enjoyed to it's fullest. Regardless of the reused scenes, art, sound and everything really, this is a must watch for any Ao Haru Ride fan. If you want to see the original middle school scenes from Ao Haru Ride with a few new scenes and text here and there, this is for you. If you think you want to start Ao Haru Ride starting here, this is the best starting point you can have.